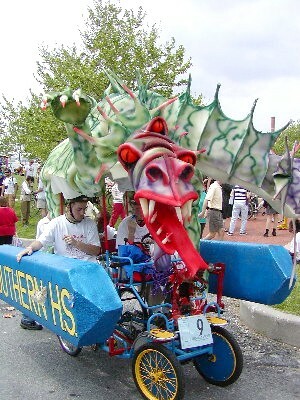 Saturday will be the annual Kinetic Sculpture Race in Baltimore. An all day event where art meets engineering to produce 100% human powered sculptures that must be able to tackle land and sea. Definitely a good time and the best way to follow and be part of the fun is on your bicycle. Things get started in Federal Hill at 9:30 am outside of the American Visionary Arts Museum, which is a sponsor and one of the coolest museums you will likely ever set foot in. You can check out the course details here. Don't miss it! Saturday: the plans to do a double shot and hit Lake Redman and Rocky Ridge, both near York, PA are thwarted by the weatherman and his predictions of large volumes of rain, thunder and lightening Friday night and Saturday during the day. Some might call me an optimist, but it's more like an addict who needs his fix, I put out word that I'll head west to the rocks of Fredneck instead, provided buckets of rain aren't coming down at launch time. We get some overnight rain but things are clear in the morning and the radar looks to be working in our favor. Four of us make it out there, a bit chilly at 10 a.m. when we get to the parking lot and the mountain is thick with fog. I don't know why, but I love the spooky feel of riding through pea soup on the trail. The rocks are wet but not too difficult, just keep a bit more weight over the rear wheel when climbing. I'm probably a couple PSI light in the rear tire but leave it be to help the tire hook up in the wetness. Of course, I flat-spot my rim later acting like a kid as we rip a section of trail and I attack trailside rock obstacles. A prime reason I run the big meat on both ends of the 26" bike. Maybe a 29er option will come out soon. But back to the ride. We hit up the big run from Gambrill park out to Hamburg Road in the Watershed like we did a few weeks ago. It is a fantastic route and except for one flat Butch suffers early on, mechanical free. Past the half-way point, on a long, extended rocky downhill I chose to go right around a tree growing in the middle of the trail. Wrong choice since someone decided to cut a sapling about knee-high and it doesn't leave me enough room to squeeze between the two. Too late, the trail is steep and I've got too much speed to do anything but make an attempt. I hope the sapling will bend as my foot and crank hit it, but no luck, it's like someone drove an oak broomstick in the ground. Over the bars, slam, tuck and roll in the rocks, I end up on my back after a series of grunting noises. My McRibs took a nice shot and I'm feeling like my gimp thumb took a hit, but overall things seem to be in one piece. I remount and finish threading my way through the rocks and wait for the others to catch up. At the bottom of the valley, we got some good climbing to get out. Ribs bruised, this is where I start to feel it, out of the saddle climbing, picking the front wheel up over obstacles, bunny-hopping logs. You use those core muscles more than you think sometimes. Such is life, you deal with it and continue your fun. For the last third of the ride the fog has burned off and the sun has come out and it turns out to be real nice. The thunderstorms that were supposed to pound us today never materialize and we rip through the last parts of our ride. Anyone who failed to show doesn't know what they missed, because the temps dropped Sunday and word is there was snow on these trails. Me? I decided to take Sunday off and let the ribs heal some. While our group was having all of our fun on Saturday the ladies were doing the same on a different route. They planned a long climb to the top of the mountain we rode last night, followed by the same route we descended in the dark. I must admit I was a little worried that they might be biting off a bit more than they could chew. 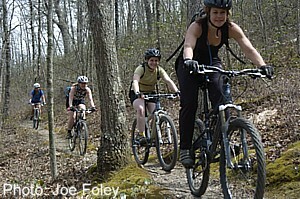 The Douthat trail maps list rate their trails like a ski area: easy, moderate and difficult. The route that was planned was all marked difficult. Julie and Maili are new riders, less than a year under their belts and nothing like this type of riding attempted before. My biggest concern was a ride that was too tough and turned either of them off to biking. It is supposed to be fun after all. With a few more experienced women on the ride, I knew they were in good hands. Let's just say that it sounds like the concern was for nothing since the ladies conquered the mountain like champs. Tons of climbing; tight narrow descents; they did it all and everyone came home in one piece. Real proud of them and impressed too. JoeP, not a lady, was in baby sitter mode since his wife was out to ride. But this did not stop him from hooking the trail-a-bike to the Karate Monkey one speed and hauling his little girl up the mountain on the ladies ride. No easy feat with the climbs out there. Big points awarded for that one. Lucky girl to have a dad like that. Sunday saw two groups split out, one that decided to drive to another loop 15 minutes out of the park and the rest of us who wanted to ride right from the lodge. From all reports I think we got the better deal. Mixed bag on our group, we billed it as a casual pace and took our time. Did a 4.5 mile climb to the Tuscarora Overlook. Some of us did most of this climb yesterday, others came down it and the ones on the ladies ride had yet to enjoy this section of trail. Did it as an out and back with a diversion of trail near the end. When we started to descend I glanced at my watch. By the time I stopped at the bottom of the 8 switchbacks to let everyone regroup (I'm guessing about 2+ miles) 7.5 minutes had past. And that was at full throttle except for the 180 degree switchbacks. Needless to say, I had a fat smile on my face. Stoner almost killed himself when he lost a disc brake pad on the descent entering switchback #1. No word if he needed to clean his chamois after that. Took a longer route back after the trail split, rode some nice ridge trail before descending again and popping out right in front of the lodge. Grubbed, packed and hit the road back home. Lots of good people for that trip, I knew about half of them and met a bunch of other cool folks. Hard to get 20 people together and not have some idiot or friction in the group, but there was none this time around. Also caught up with Nick and Jason on Friday night as they were on their own adventure pulling BOB trailers through the mountains. Running slicks on their MTBs with a spare pair of tires to do the swap for dirt attacks. They logged some big miles over something like 4 days and just happened to pull into Douthat at the end of day two and stumbled on our group. You can check out some of their pix over at the Pedal Shop board.